Have you ever wished you could get a quality treadmill workout without paying expensive gym prices? Look no further than the Treadmill Bike by the Bicycle Forest. 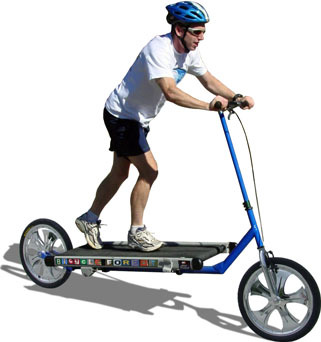 The Treadmill Bike offers the same fat burning benefits of a conventional treadmill without the membership fees! When the weather's nice, the last place you want to be is cooped up in some stuffy gym. Imagine running through evergreen forests or strolling down country roads. All of this is possible thanks to the rugged design and all terrain tires on the revolutionary Treadmill Bike. The Treadmill Bike's hard wearing belt offers a sure grip while protecting your feet from dirt and other contaminants commonly found on the earth's surface. Because the Treadmill Bike is also a mode of transportation, use it instead of your car for everyday tasks such as shopping, and traveling to school or your place of work. Thinking of taking the Treadmill Bike to the grocery store? Be sure to stock up on ice cream while you're there. You will have earned it. Treadmill Biking is fun for the whole family. The variable resistance feature* means that treadmill bikers of different abilities can workout together and no one will get left behind. Today's urban landscape is increasingly dominated by large SUV's and multilane roadways. The Treadmill Bike's elevated running platform means you'll be seen over the hood of even the most heinously overbuilt motor vehicle. Take it off some sweet jumps! * The variable resistance feature is not yet available. The best rides are the ones where you bite off much more than you can chew--and live through it.